Eight artists have taken top prizes at Sealaska Heritage Institute’s eighth biennial Juried Art Show and Competition, and five young artists also placed in SHI’s new Youth Juried Art Exhibit. Tsimshian artist David R. Boxley won the top two awards: Best of Show and Best of Formline for his piece, Txaamsem. Carving and Sculpture Division (wood and metal carvings and sculptures): Jennifer Younger won Best of Division and Best of Metal Category for her piece, Hungry Sea Lion and Art (Bugs) Nelson won Best of Wood Category for his piece, Raven Mask. Sewing Division (skin and fur, beadwork and other): Kandi McGilton won Best of Division and Best of Beadwork Category for her piece, Lax’o; Jennie Wheeler won Best of Skin and Fur Category for her piece, Sea Otter Coat; and Clarissa Rizal won Best of Sewing “Other” Category for her piece, Northwest by Southwest. Weaving Division (Chilkat, Ravenstail and basketry): Clarissa Rizal won Best of Division and Best of Chilkat Category for her weaving, Chilkat Child; Tiffany Vanderhoop won Best of Ravenstail Category for her weaving, Ravenstail Apron; and Merle Andersen won Best of Basketry Category for her piece, Clam Basket. 2-Dimensional Division (paintings, drawings and prints): David R. Boxley won Best of Division and Best of Painting and Drawing Category for his drum Txaamsem, bring his total number of awards for that piece to four and Alison Bremner won Best of Print Category for her print Cat Lady, bringing her total number of awards for that piece to two. 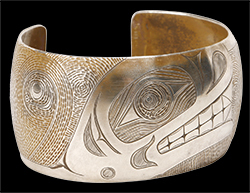 The late Malcolm Miller, to whom the 2016 Juried Art Show booklet was dedicated, received an honorable mention for his Northwest Coast bracelet and earrings. 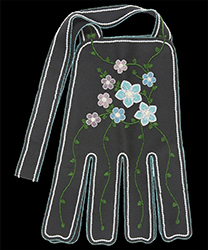 Vivian Benson won an honorable mention for her piece, Nsipsiip’nsgu, as did Elaine Jack for her piece, Octopus Bag. Other pieces selected for exhibit included Beaver by Jennifer Younger; The Watchman copper pendant by Jeffery Sheakley, Jr.; Visions of the Spirit World by Andrew W. Tripp; Bear Spirit by Andrew W. Tripp; Beaver Dagger by Andrew W. Tripp; Medicine Man Dance Staff (Íxt' Shí S’aatí wutsaagáyi) by Archie Cavanaugh, Jr., Shaas T’aak; Raven Dance Mask by Art “Bugs” Nelson; Shaman’s Rattle by Art “Bugs” Nelson; Fancy Copper by Mick Beasley; Whale and Diving Raven by Mick Beasley; Tlingit Mask with Ears by Mick Beasley; The Traveler by Alison Bremner; In God We Trust by Alison Bremner; Hummingbird by James Johnson; Sisiutl by James Johnson; Love’s Embrace by William Gamaas Bolton; Eagle and the Wolf Circling by Margaret Morris; Dancing with our Ancestor Dance Apron by Mike Dangeli; Headband by Elaine Jack; Chilkat Seasons Dance Apron by Lily Hope; Ravenstail Headdress by Tiffany Vanderhoop; and Chilkat Killer Whale by Anna Brown Ehlers. Jurors were the acclaimed artists Stephen Paul Jackson and Nicholas Galanin. Shgen Doo Tan Robyn Kay George served as juror consultant for the weaving/sewing divisions. Jurors reviewed the pieces blindly, meaning the names of artists who submitted pieces were not disclosed. In total, the Juried Art Show features 36 pieces by 22 artists. The show also includes an Exemplary Works exhibit featuring pieces made by some of the best Northwest Coast artists alive today. Featured artists include David A. Boxley, Delores Churchill, Robert Davidson, Nathan Jackson and Preston Singletary. 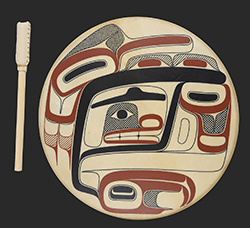 The exemplary pieces featured reflect the best of the art form today as learned from the old masters and underscore the institute’s quest to recognize Northwest Coast art as a national treasure. The Juried Art Show and Exemplary Works exhibit will be on display in the Nathan Jackson Gallery at the Walter Soboleff Building in Juneau through Sept. 30. The Juried Youth Art Exhibit includes 34 objects made by 28 individual young artists and one artwork that was made by 61 6th grade students from Dzantik’I Heeni Middle School in Juneau. The group piece, Warrior armor and helmet, won 1st place in the middle school division, and The Fox by Tessa Williams of Gustavus won 2nd place. 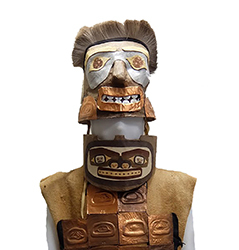 For the high school division, Jeanette Kaleikau-Buxton of Metlakatla won 1st place for her acrylic on paper, Txaamsem and the Steelhead Salmon; Sky McInturff of Ketchikan won 2nd place for her cedar bark hat, Snail’s Trail; and Faithe Gray of Metlakatla won 3rd place for her bentwood box, Story of my Family. The following 10 artists received honorable mentions: Aani Perkins of Sitka; Andrea Cook of Hydaburg; Bianca Adams of Ketchikan; Kathryn Price of Juneau; Jeanette Kaleikau-Buxton of Metlakatla; Victoria Lent of Metlakatla; Angelika DeLeon of Sitka; Shawaan Jackson-Gamble of Kake; Sky McInturff of Ketchikan; Elizabeth Staveland of Juneau; and Victoria Lent of Metlakatla. Staff was thrilled with the number of pieces young artists submitted from across Southeast Alaska and with the quality, especially some of the works made by students in Metlakatla and Ketchikan, said SHI President Rosita Worl. “The communities of Metlakatla and Ketchikan should be commended for their dedication to teaching Northwest Coast art and for integrating it into schools. I want to especially recognize artists John Hudson and Debbie McLavey who teach Native art in those communities. We clearly could see their expertise and guidance reflected in their students’ work,” Worl said. Lance Twitchell, a Tlingit artist and formline teacher, served as juror. The competition was open to all youth in grades 6-12. The youth exhibit will be on display at the Juneau Arts and Culture Center through June 30.